I’ve always loved sundials. The ability to use the sun’s position to cast a shadow that can tell both time and the seasons has such an elegant directness. No elaborate clock mechanism. No calender. Just a slow moving shadow, marking time’s passage. But of course, I have my own idea of how a sundial should be configured. In this drawing, from my personal notebook, I envision an inverted globe, an etched bronze bowl, with the continents and major cities, along with latitude and meridian lines, in lieu of hour lines, as well as the the tropic, arctic and antarctic latitude lines. The globe’s markings are aligned such that the nearest pole, north in my drawing since I live in the northern hemisphere, is pointing due south. From this position the gnomen extends and points to celestial north. This puts the gnomen parallel to the Earth’s rotational axis. The sundial’s location is marked at the very bottom of the bowl by a small hole through which any rain water may be drained. Along the gnomen, at the center of the hemispheric bowl is a small etched bronze spherical globe. The globe is also marked with the continents. The globe is aligned with the sundial’s location pointed straight up to the zenith and the north pole pointed toward celestial north. This puts the globe’s map in the same spatial orientation as the real Earth. This arrangement has interesting properties. The small globe is sized such that the penumbra forms a small dark dot of a shadow cast upon the interior of the bowl, indicating the exact position upon the Earth where the sun stands at zenith at that moment. The shadow is always the same size since the small globe is always the same distance from the shadowed bowl surface. Thus it marks both the solar time and the season. If the shadow falls south of the equator, it is fall or winter. If it is further south today than it was yesterday, it is fall. If it is further north, it is winter. If it lies on the southern tropic latitude line, it is the winter solstice. If the shadow lies on the equator it is one of the equinoxes. Similarly the spring and summer seasons may be discerned. Given that the small globe is in the same spatial orientation as the Earth, it will show where on the face of the Earth the sun is shining. The terminus of the sun falling on the globe will be the same as the Earth. From that, one can see which places on Earth are seeing a sunset or sunrise. One can also see the effect of the Earth’s inclination to its orbit around the sun as the seasons change. 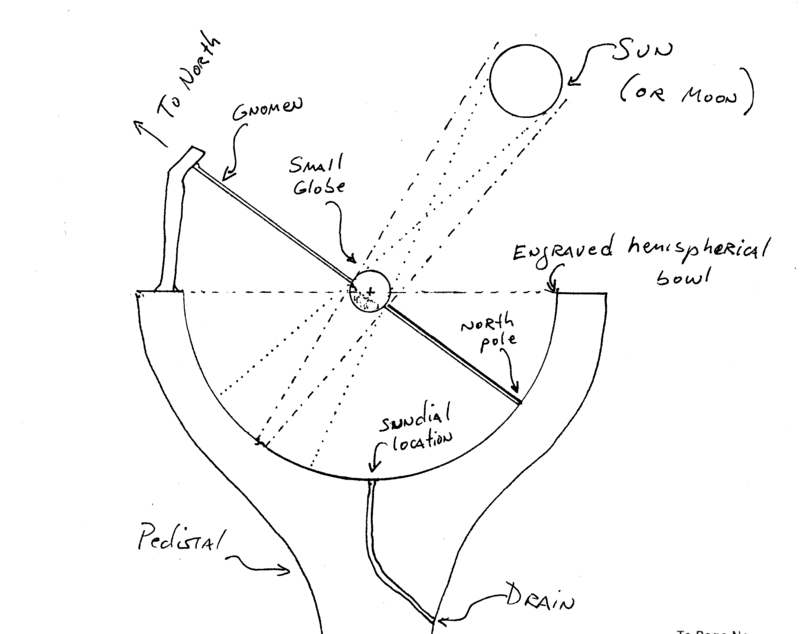 I drew the sundial as a garden ornament, but what I really would love to see is a very large public art installation in a public square or corporate headquarters, set partially into the ground, the lip of the bowl forming seats upon which passersby may rest awhile, while looking over their shoulders at time’s passage. Consider the educational value of such an installation. Any large corporation want to work with me?